Our chicks have reached the Velociraptor stage. ...got too big for their box and moved into an interior pen in the chicken coop. Nineteen of our twenty chicks have made it, a decent ratio. They've been growing and growing, and a few weeks ago we started leaving the interior cage door open so they could mingle with the adult chickens and begin stepping out into the Big Wide World. It was funny to watch them peek around the corner for the first time. The adult chickens have never -- not once -- picked on the babies. ...but now they're bravely venturing out into the driveway area. They tend to run in packs, and Don says at this awkward adolescent stage they look like so many miniature Velociraptors (if you remember your Jurassic Park movie). 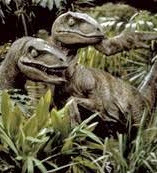 Velociraptors on the loose! Eeek, run! How lucky you are that the older chickens don't pick on the younger ones! I had to fashion an "escape route" for my pullets so they could get into a pen away from the older hens. Things are better now, but there is still a "pecking order." Ha! That is what we call our young chicks. From your blog it appears that you live in either Benewah or Latah county. I live in Moscow. Moscow and Lewiston host preparedness fairs each year that are open to the public and have gained more participants and viewers each year. If you all are in Moscow on June 28th, the ham radio operators are having a field day at the Latah County Fairgrounds from late morning through Sunday. It is open to the public also. With the Department of Homeland security involved? Forget it! We are just now venturing forth as far as breeding chickens. On the recommendation of a friend we have moved our adult chickens to another coop/run in order to allow the chicks we hope will hatch to be a little safer until they can get bigger. We don't really have space for a transition area. It's just as well because we are planning on keeping the layers and future meat birds separated.